Postprocessing:Done Then seem to hang for hours Compressing All.zip. My Operating system is Windows 10 PRO. Webodm using Docker. 16 GB Ram, Intel I7. 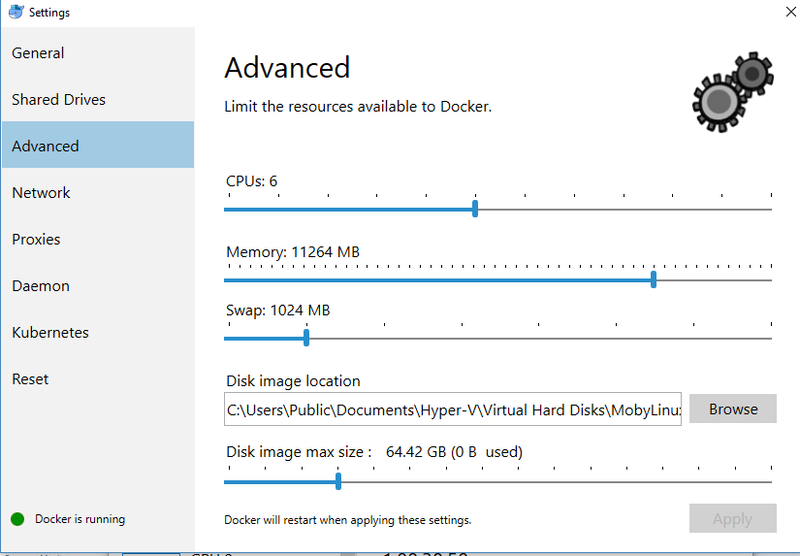 @VDS have you configured docker to use more memory? It’s likely that this is a problem caused by low memory. Yes I upped the memory to 12gis, increased processors, increased swap and vd size. Still hangs. and it worked. The point cloud and ortho did not have the correct geo-positioning but i was able to use in in my earthwork files after a rotation. Made it work but would like to figure it out so I don’t have to repeat it again. Thanks for any help or direction you can provide. Mm, strange. Could you share the images and GCP file you used, as well as the preset information you used for processing? You can use Google Drive / Dropbox to share the images and GCP file. Images and GCP Files have been uploaded to gogledrive see link below. gcp_file_EPSG3605 100-105.txt (Ascii text GCP file EPSG:3605 (((http://spatialreference.org/ref/epsg/3605/) This on Does not Complete Hangs on compressing All.zip. Phantom 4 Pro Images (Compressed zip folder containing Images) Sorry for all the images on a small site but I have elevation restriction in the project area. Then I used Fast Orthophoto with resize image 2048 no GCP and completed 1hr 22Min. Did some reading and changed the Header file and renamed the GCP file to gcp_file_100-105.txt Header projection changed to (EPSG:2256 +proj=lcc +lat_1=49 +lat_2=45 +lat_0=44.25 +lon_0=-109.5 +x_0=599999.9999976 +y_0=0 +ellps=GRS80 +datum=NAD83 +to_meter=0.3048 +no_defs) and it worked geo-location not good but coordinates of point cloud and ortho image insert into CAD with no projections and match other field survey data. good for today but leaves me wondering what I’m doing wrong. any other questions please contact me. Hi! I have the same problem. When i use photos from Phantom 4 Pro without GCP all is ok, but when i add GCP file WebODM not finish task. It create ‘assets’ directory of task with all products (ortophoto, pointcloud, etc.) then delete ‘assets’ directory of task and create it again with all products (ortophoto, pointcloud, etc.) then again delete ‘assets’ directory and it stuck in this infinity loop. When i cancel task the ‘assets’ directory of task with all products (ortophoto, pointcloud, etc.) is available on WebODM data directory (i use ‘–media-dir’ parameter) but it’s unavailable via WebODM interface because task status is ‘cancelled’. Same problem, In my workflow, I place all the images and the GCP file in the same folder, the when adding, I select all the images and the GCP file. Is this correct? It will stay like this for hours. I wouldn’t care if I could find the assets somewhere. GCP file Generated from WebODM interface (the file originally wouldn’t even come close to processing, when I looked at it it appeared as if it was a combination of tab and space delimited text, I then cleaned it up a bit removing all but the spaces) I used the file in un edited and it didn’t process either. still waiting. is there no way to access the assets before I hit cancel? Mm, if you press “Cancel” and then “Restart” (important! Choose the dropdown arrow, don’t press the main “Restart” button, use the arrow button next to it) --> “From Orthophoto”, are you able to get the results? People have been reporting this problem before, but I’ve never been able to reproduce it myself. It’s puzzling. Could everyone who’s having this problem please share the amount of RAM available on your machine / allocated to the docker environment? Perhaps this is a memory problem (eg. archiving takes up too much memory, the OS kills the web worker in charge of processing tasks --> WebODM hangs). If a task hangs at “Compressing All.zip”, keep the hung task (do not cancel it) and create a new task (upload 2-3 images to the task) and press “Start Processing” do you get any output from the newly created task? Did you mean for us to create a new task in the same project? I didn’t see a way to do that. Ok, so I panicking a little. I’m supposed to fly a 550 acre quarry next week and I getting anxious. 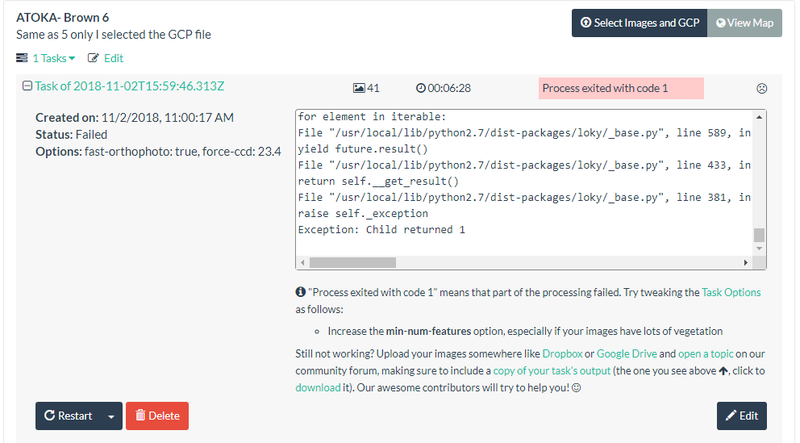 lastly, I used the corrected GCP file and selected it along with the images and after 6:28 I got a new error. Same error heres a link to my Data, should be 40 images, and 2 GCP files, 1 exactly as it came from the webODM GCP interface and the one I edited, Thanks Again! @mwfoshee please open a new topic if this is a different issue. Thanks!! Either on the same project or a new project. Didn’t matter. Seems like it’s not a memory issue, since processing started it means that nothing was killed. Seems to get stuck only with datasets including GCP files then. Will do, I’m not sure if it’s a new topic. It appears that when the coordinate system is WGS84 this is the issue and when the CRS is anything else this is still an issue. If someone is able to figure out a way to reliably reproduce this issue, please document it, attach your dataset, your GCP file and report as much information as possible (environment, operating system, free disk space, memory allocated, etc.). I couldn’t reproduce this with the dataset from @VDS.